If you ARE the gift-giving sort, but diamonds and trips to far-off places aren’t exactly in the budget, I’ve come up with a short list of comfort items I’m proud to recommend. At the top of the list, of course, is my book, One Heart At A Time. It’s my own story of love, loss, passion, and my desire to change the world. I want you to read it because I want you to know that you have the power to do good things simply by having a heart that is willing to serve! The Gravity Blanket is also a product I’ve purchased many of for those members of my household that benefit from it’s therapeutic qualities. This weighted “throw” helps calm anxieties and give you a peaceful night’s sleep. Like a Valentine hug all night long. You’ll get 15% off if you use the order code DELILAH. PeachSkin Sheets are the softest, coziest, and coolest (physically and metaphorically speaking) sheets you will ever own. I’ve purchased a set for every member of my family. I love the softness, my husband loves the athletic apparel technology that keeps him cool all night long. 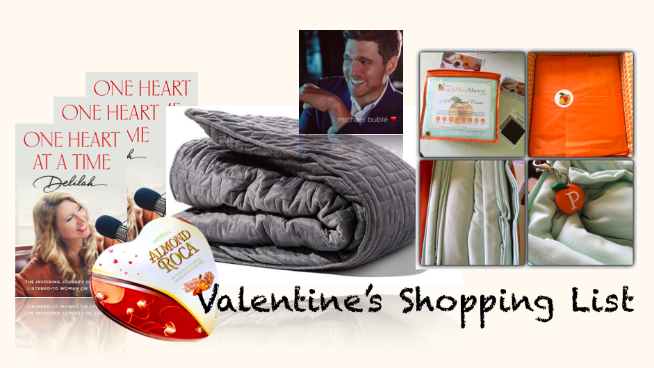 And while you’re all cuddled up under your PeachSkin Sheets, with that Gravity Blanket embrace, reading One Heart, you’ll need to turn on Michael Buble’s new CD, love. This man’s velvet voice is so full of heart you’ll feel it from your toes to your nose! But don’t forget chocolate. Gold foil wrapped Almond ROCA chocolates to be precise. My friends at Brown & Haley’s have perfected this exotic concoction of buttery ROCA enrobed with chocolate and coated in almond pieces. Makes my mouth water just talking about it! You’ve got one more day to enter my Sweepstakes where you could win everything on my list. Get thee to Delilah.com RIGHT NOW and put your name in. The winner will be randomly selected, and it could be YOU!